MEZIA Nied. in Engl. & Prantl, Nat. Pflanzenfam. III, 4: 58. 1890. Diplopterys sect. Mezia (Nied.) Nied., Arbeiten Bot. Inst. Königl. Lyceum Hosianum Braunsberg 4: 16. 1912.—Type: M. araujoi Nied. Stenocalyx Turcz., Bull. Soc. Imp. Naturalistes Moscou 31: 393. 1858, nom. illeg., non Stenocalyx Berg, 1856 (Myrtaceae).—Type: S. involutus Turcz. [M. includens (Benth.) Cuatrec.]. Woody vines, shrubs, or small trees; stipules minute, interpetiolar, caducous; petiole eglandular; lamina bearing impressed glands in abaxial surface at base or eglandular. Inflorescences tightly reddish- or brown-sericeous throughout, axillary and often terminal, containing much-reduced bractlike leaves, with decussate branching, the flowers ultimately borne in an umbel of 4 terminating a stalk bearing 1 (–3) pairs of sterile bracts and, at its apex, 4 floriferous bracts subtending the 4 peduncles; bracts and bracteoles abaxially sericeous, adaxially glabrous or sparsely sericeous; floriferous bracts smaller than bracteoles; floriferous peduncle well developed; bracteoles borne just below flower, large, globose-cymbiform, persistent or deciduous before maturation of the fruit, the inner enclosing bud until anthesis, the outer enclosing bud and inner bracteole; pedicel absent or very short, up to 2 (–5) mm long in fruit; old flowers (not setting fruit) deciduous at base of peduncle, not at joint between peduncle and pedicel. Sepals narrowly oblong or spatulate, the anterior eglandular, the lateral 4 each bearing 2 large, compressed, distinct or partially to completely connate abaxial glands; corolla bilaterally symmetrical; petals lemon-yellow, the posterior sometimes red in the center, glabrous or abaxially hairy; androecium bilaterally symmetrical; stamens dimorphic, the 5 opposite sepals differing from the 5 opposite petals in size and shape, and sometimes in pubescence; gynoecium bilaterally symmetrical; ovary with the carpels completely connate; styles 3, stout, the apex with a large internal stigma and dorsally truncate or short-hooked or pedaliform, the anterior style shorter and often slenderer than the 2 posterior styles. Samaras separating from a pyramidal torus; samara orbicular or butterfly-shaped, the membranous lateral wings cleft to nut at apex and base or more often confluent at base; dorsal wing present, and often additional wings, winglets, or crests developed between dorsal and lateral wings or outside lateral wings; ventral areole ovate or broadly to narrowly elliptical. Chromosome number unknown. Fifteen species of South America, with one species extending into Panama, mostly growing in lowland wet forests, one species in savannas and adjacent gallery forests. [map] — Regional key to genera: Central America. Mezia is a very distinctive genus, defined by the enormous globose-cymbiform bracteoles that enclose the flower bud until anthesis with the inner bracteole around the bud and the outer bracteole enclosing the bud and most of the inner bracteole. Accompanying the elaboration of the bracteoles there has evolved the reduction of the pedicel to nothing or a rudiment and abscission of old flowers at the base of the peduncle instead of between the peduncle and the pedicel. The reddish or dark brown appressed vesture of the inflorescence, while not unique, is another characteristic found in all species of the genus and a helpful field character. Two of the ten species (M. araujoi and M. includens) are included in the latest sampling of DNA sequences (Davis & Anderson, 2010 [pdf]), and the bootstrap support for the genus is 98%. Mezia resembles Jubelina Adr. Juss. in having four-flowered umbels, long narrow sepals, compressed or connate calyx glands, and large mascagnioid fruits. 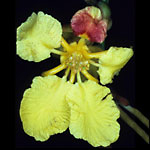 Jubelina also has fairly large bracteoles, but they are not globose and do not enclose the flower buds; Jubelina has well-developed pedicels. Mezia is unique in this clade in having interpetiolar stipules; in the other six genera, including Jubelina, they are epipetiolar (or absent). Etymology: The name Mezia honors Carl Christian Mez (1866–1944), a German botanist who published extensively on Lauraceae, Bromeliaceae, Myrsinaceae, and other groups (Butzin, 1966 [pdf]).